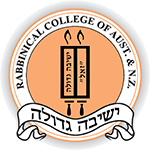 Memories - Rabbinical College of Australia and N.Z. Rabbi Aaron Eliezer Ceitlin was a member of the fourth Kevutzah (group) of Shluchim to spend two years as the Lubavitcher Rebbe’s emissaries to the Yeshivah Gedolah in Melbourne. Today, he serves as a Shliach in Tzfat (Safed - Israel), and as the director of several Chabad-Lubavitch institutions.